Climate scientists have finally demonstrated that rising carbon dioxide in the air is trapping more of the sun's heat. 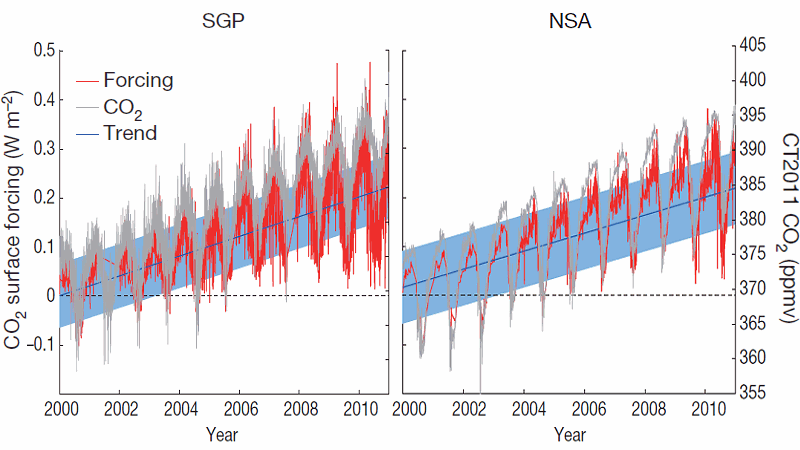 A paper published Wednesday has used a decade of painstaking measurements to confirm the basic greenhouse mechanism of global warming beyond a reasonable doubt. Physicists have foreseen greenhouse warming of the Earth since the 19th century, and the greenhouse effect is the foundation of climate-change science. This is accepted knowledge by now, but science is supposed to make really sure of things. The game of science is unusually precise. Since it's spring training season, I'll use an analogy from baseball. A ballplayer can hit a home run by batting the ball over the outfield fence—that's when we all start cheering (or groaning)—but the run is not formally recorded until the umpires see the batter step on each base, in the right order, and set foot on home plate. The ballplayer has to go through all the motions. In climate science, it's almost universally accepted that rising carbon dioxide (CO2) levels in the atmosphere are making the atmosphere warmer. That ball has been over the fence for many years now. But science has to go through all the motions. Greenhouse physics in the lab, many decades of weather observations and a wide range of computer models based on evidence from a million years of prehistory all support the scientific home run. But until now we haven't gone through the motions for one question: Do we truly observe the mechanism for greenhouse warming on the ground, in the actual sunlight passing through the actual atmosphere? This hasn't been easy. Satellite observations show the top of the atmosphere, not the bottom where we live. Also, computer models are still models with many moving parts, and the measurements, whether from space or from the ground, are hard to make and subtle to interpret. A team of six scientists led by Daniel Feldman, of Lawrence Berkeley National Lab, used 11 years of ground observations to demonstrate that the 6 percent rise in levels of CO2 since the year 2000 led to a 10 percent rise in CO2's share of the greenhouse effect, specifically the infrared energy kept within the blanket of the atmosphere. Their results were published Wednesday in the journal Nature. The data came from U.S. Department of Energy observation sites in Oklahoma and Alaska where exquisitely sensitive instruments watch the skies at a wide range of wavelengths. The three most important greenhouse gases—water vapor, CO2 and methane—absorb high-energy sunlight and re-emit it as long-wave infrared (heat) radiation, which is trapped underneath the atmosphere. Because each gas produces its own infrared "color" or blend of wavelengths, it's possible to sort out their separate effects. Feldman's team used only data from clear skies, allowing them to ignore the weather. They made careful corrections for the temperature of the air and the instrument itself. And the length of the 11-year record allowed them to ignore seasonal ups and downs and extract a clean long-term trend at both sites, shown below. Statistics are always crucial in a study like this. Feldman's results passed their statistical tests with flying colors. According to the standards that scientists follow, these results are real and robust. The work of Feldman's team also proves that direct, ground-based observations are now good enough to match the indirect, expensive satellite data we've relied on to understand global climate. Baseball also has the informal tradition of the "neighborhood play," in which an infielder rushing to touch a base ahead of an oncoming runner may only sort-of touch it in the interest of avoiding injury, but still have the umpire rule the runner out. Climate change debaters will no longer have that analogy when they argue that after all these years the umpires have never definitively, formally ruled on the greenhouse effect.